The global biologics drug development market was estimated at $2.79 billion in 2017 and is expected to grow over $8.46 billion by 2027. Biologics are defined as pharmaceutical products obtained from living cells or microorganisms. These are complex and large molecules consisting of proteins, peptides, nucleic acids, sugars, and cellular structures or a combination of these. The pharmaceutical industry is shifting toward biologic drug products due to their advantages over small molecule such as minimal toxicity and safety issues, high target specificity, and better understood mechanism of action. These factors prompt increased interest in the biologics; hence, there is a higher trend toward their discovery and development process. The purpose of the study is to gain a holistic view of the biologics drug development market in terms of various factors influencing it such as recent trends, technological advancements, and regulatory aspects of the market. The scope of the report is centered upon conducting a detailed study of the solutions allied with the biologics drug development market. 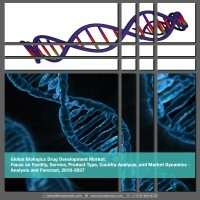 This research report aims at answering various aspects of the global biologics drug discovery market with the help of key factors driving the market, threats that can possibly inhibit the overall market growth, and the current growth opportunities that is going to shape the future trajectory of the market expansion. The global biologics drug development market was estimated at $2.79 billion in 2017 and is expected to grow over $8.46 billion by 2027. The introduction of targeted therapies coupled with rising adoption of patient-centric personalized medicine is expected to fuel the demand for biologics drugs in the future. Moreover, ever-increasing understanding of the cell physiology and stress, as well as the factors involved in protein production and heterologous gene expression have empowered the use of different living factories in the development of novel therapeutic biologic drugs. The increasing biologics approval each year indicate the effectiveness of these products. The biologics drug development market presents with opportunities to change the treatment options. The development of antibody drug conjugates, glycosylated antibodies, Chimeric Antigen Receptor-T (CAR-T) cell therapy, and bio-betters presents opportunities for the further growth of the biologics drug development market. The report provides in-depth SWOT analysis of different key players of the market, supported by extensive financial summary of each. The key players of the market include Abbvie, Inc., Allergan Plc, Boehringer Ingelheim International GmbH, Charles River Laboratories, Catalent Inc., Lonza Group, MabPlex Inc., Samsung Biologics, and Amgen, Inc., among others. • What are the major market drivers, challenges, and opportunities in the global biologics drug development market and their case studies? • What were the market shares of the leading segments and sub-segments of the global biologics drug discovery market in 2017, and what will be the shares in 2027? • How will each segment of the global biologics drug development market grow during the forecast period, and what will be the revenue generated by each of the segments by the end of 2027? • How will the industry evolve during the forecast period between 2017 and 2027? • What will be the growth rate of the PharmaExcess segment during the forecast period? • Who are the key outsourced manufacturers of the biologics drug development market? • How the market has been segmented on the basis of services? Which service is highly adopted in the biologics drug development process? • Which geographical location will contribute to the highest revenue generation of the biologics drug development market? With the increasing life expectancy and changing lifestyle of the world population, the healthcare needs across the world are changing. Physical inactivity, rising obesity, and stress along with an increase in geriatric population is expected to raise the predisposition toward the chronic diseases. The introduction of biological therapies gave a new ray of hope for people suffering from chronic diseases. The primary reason for such a shift toward biologic products is better efficacy, absence of innovator small molecule drugs, better interaction with the target as well as specificity toward targets. The entry of biosimilars makes these effective therapies more affordable, though the concern regarding them after effects still exists. The pharmaceutical industry is a multibillion market consisting of innovator drugs and generics. The pharmaceutical market consists of companies involved in the research, development, manufacturing, and commercialization of drugs for human and animal use. The evolving healthcare needs across the world has led to the rise of novel medication for the treatment of various chronic diseases. Biologics is one such type of medication with proven efficacy and safety. The market has been segmented into product class, facility, services, and geographical regions. The report offers the reader with an opportunity to unlock comprehensive insights with respect to the market and helps in forming well-informed strategic decisions. The research uncovers some of the substantial parameters that must be taken into consideration before entering into the market. The biologics drug development involves different types of services for the development of biologics as well as facility for their manufacturers. Based on services the market can be segmented into clinical manufacturing, formulation development, bioassay development, and analytical services. Based on services the market can be segmented into clinical manufacturing, formulation development, bioassay development, and analytical services. Clinical manufacturing is the dominant segment with the highest revenue contribution as well as the highest CAGR value for the forecast period from 2018 to 2027. Based on the product class, monoclonal antibody is anticipated to be the major contributor to the market. The next contributing segment is vaccines. However, the fastest growing segment is expected to be growth factors market. The market can be further segmented based on facility into in-house, outsource, and PharmaExcess. The in-house manufacture of biologics is the dominant manufacturing facility as most of the biologics production and manufacture is done in-house by biopharmaceutical companies. However, PharmaExcess is expected to grow at the highest CAGR during the forecast period. Geographically, the market is segmented into four regions namely, North America, Europe, Asia-Pacific, Latin America, and Rest-of-the-World. The largest contributor to the growth of the global biologics drug development market in 2017 was North America due to the presence of pharmaceutical companies involved in R&D of biologics. North America was followed by Europe in terms of growth. However, the fastest growing region was Asia-Pacific due to the increasing presence of Contract Research Organisations (CRO).